North Korea and the United States are trying to set a new date for a meeting between their top officials, Seoul's foreign minister said Friday in response to skepticism about momentum in denuclearization talks. US Secretary of State Mike Pompeo was supposed to meet Kim Yong-chol, a senior aide to the North's leader Kim Jong-un, in New York this week. But it did not occur amid reports that Pyongyang demanded a delay in the talks. 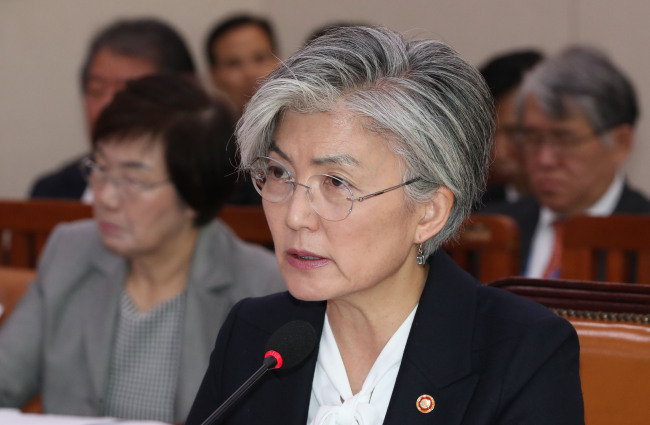 "The US has said conclusively that the talks have been postponed and will take place at a rescheduled time," Foreign Minister Kang Kyung-wha said at a National Assembly session. The US does not appear to be attaching big meaning to the delay in the meeting itself, she added. On Russia's request for a closed-door UN Security Council session on North Korea, the minister said the issue of sanctions will likely be a main agenda item. Russia and China have called for the easing of sanctions on the North, which has stayed away from provocative acts for months. Kang said the government keeps a plan to hold a groundbreaking ceremony for the re-connection of inter-Korean railways and roads before the end of this year. "(We) are in continued consultations with the US (on the matter)," she said, adding there's still a divergent view to discuss between the allies.